14th century Hard-fired stoneware starting ca. 1350, red-brown and flamed utilitarian articles. 1402 First documented mention of potters in the town of Höhr. End 16th century Blue-grey salt-glazed stoneware. Master potters from Siegburg and Raeren relocate to the Westerwald area. 1643 Cooperative Guild, with its own Guild coat-of-arms, of all "jug-" and "stein-bakers" living within a 5-mile radius of Grenzhausen. 17th century The golden era of Westerwald stoneware. After 1650 Manganese violet is used as glaze colorant in addition to cobalt blue. 1771 More than 600 potters work in the Westerwald. 1776 The "pipe-bakers" Guild of the Electoral District of Trier ((Kurtrier). 1804 Termination of the Trier District jug-bakers’ Guild. 1814 Termination of the local jug-bakers’ Guild. 1846 Beginning of mechanized manufacture; the first clay-cutting machine in Höhr. 1863 First clay pipe (conduit) press in Höhr. 1865 First steam-driven machine in Höhr. 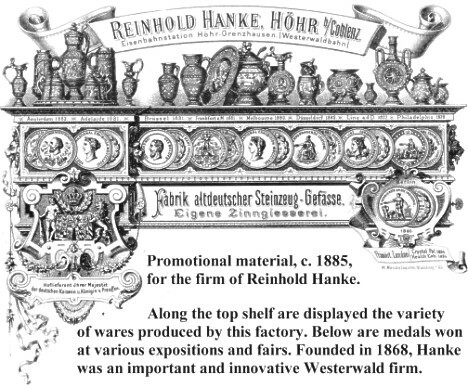 1868 Reinhold Hanke founds the first "Fine Stoneware Factory" (Feinsteinzeugfabrik) in jug-bakers’ land. First appearance of "Historismus". 1879 First stein press in Baumbach. 1882/83 First round furnaces in Höhr and Grenzhausen. 1894 Approximately 270 ceramic establishments, with about 2000 employees, in jug bakers’ land. After 1900 Beginning of Jugendstil stoneware. Well-known artists prepare designs for Westerwald stoneware: Ernst Laurenty, Henry van de Velde, Richard Riemerschmid, Paul Wynand, Peter Behrens, among others. 1902 Development of copper red glazes in the salt furnace. After 1920 Introduction of slip-molding in jug bakers’ land. Since 1927 Resurgence of artistic handiwork (Elfriede Balzar-Kopp and Wim Mühlendyck). 1952 First gas-fired tunnel kiln in the Land of the Jug Bakers. Mid-1983 The last of the wood-fired salt-glazing furnaces is shut down because of environmental considerations; only furnaces equipped with gas-scrubbing equipment may be used for salt-glazing.